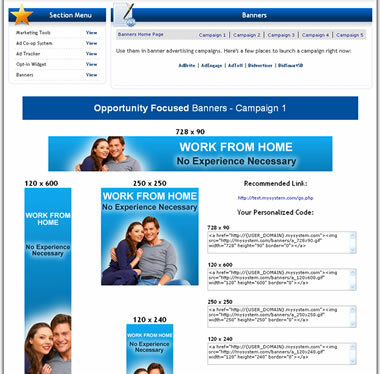 Ad Co-op System Main Menu - Our powerful ad co-op system can turn any group into a marketing powerhouse. It's simple, one person sets up a co-op, adds other users to the rotation and our system does the rest. Unlike inferior systems that rotate the user lead pages, our innovative system only rotates after the lead is generated, so everyone in the co-op gets an equal number of leads. The lead is directed to the correct user's redirect page (tour), autoresponder and contact manager. We run nationwide co-ops on this very system all the time! Create New Ad Co-op - To set up an Ad co-op, simply give your new ad co-op a name, choose which capture page you want to use for the co-op, and choose a thank you page. This does not interfere with the user being able to use this same capture page on his own. Manage Ad Co-op and Measure Results - Once you've set up the co-op, you will start directing traffic to the specific URL the system provides. But first you must add the participants who will receive leads from the co-op, just add their username to the rotation. This page also gives stats on co-op page hits and conversions (leads generated) and conversion ratio to help you identify which co-ops are working best. 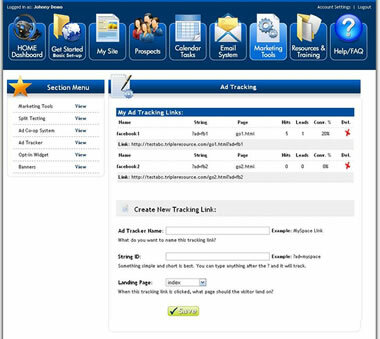 Fantastic and easy way to track the effectiveness of your ad placements. Track 1 ad, or track 1,000 and get the above stats on each one...now your advertising can really pay off! Opt-in Form Wizard - Each custom lead capture page comes with it's own opt-in form wizard. As you can see by the graphic it's very simple to collect the information desired from the prospect and send them a specific message campaign and redirect to a specific page (any URL). Use on Your Own Sites - our email platform works very similar to the popular email providers. Build an opt-in form in your back office, and we'll supply you with the necessary HTML code to paste on your your website or blog...anywhere outside of our system. This gives you more lead capture "hooks" and could very well give you exponentially more prospects! Ever wondered if you have the same traffic landing on two different pages, which one converts into the most leads? Well now you can with our easy to use Split Testing feature. 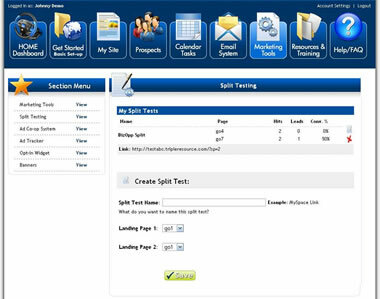 Choose any 2 of all of your available lead capture pages and create a split test link...our system does the rest. for each Split Test that you create! Jazz up your blogs or launch external advertising campaigns tghrought the numerous banners advertising networks and watch your leads grow. This is the section where we provide preview of the banners and the neceessary personalized code to go laong with each banner. Of course, these banners can be customized and branded for particular products or opportunities.